I’ve been working on some projects, and have fallen behind in my blog posts, so I shall dip once more into the archives… (insert dramatic piano chord here). 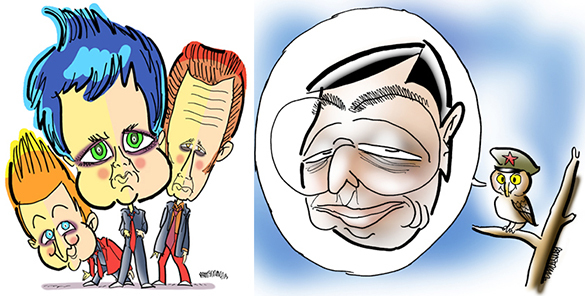 I’ve always loved caricatures, and I’ve done a lot of them– some for assignments, others simply to promote my work. Here’s an assortment, I hope you’ll recognize some of them. Answers at end of post. Note: There are puns and jokes in some of the caricatures. I’ll list these at the end as well. End of caricatures, scroll down for answers. 1. B.B. King is playing two bees and a crown, “spelling” out his name. 2. There’s a little angel on Bishop Sheen’s chalkboard. He would write on it during his television show, sometimes completely filling it up. He would then walk away from it, and continue speaking. When he returned to it, the board would be clean– and he’d thank his “little angel” for helping him out. 3. Everybody knows owls say “Who?” This particular owl is saying “Hu.” A single red star is a symbol for communism. 4. Picasso is receiving a swift kick while holding his anti-war painting, Guernica. on The Who’s hit record, I Can See For Miles. a spider hanging off the orange planet. Bassist John Entwistle’s face appears in the orange planet. 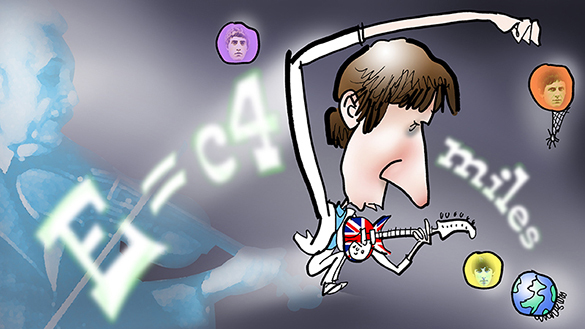 Entwistle wrote the group’s most famous song that was not written by Townshend: the novelty number, Boris The Spider… whew! Meet The Beatles Parody: Vote For Me, Yeah, Yeah, Yeah! Leaves Of Grass, A Fistful Of Dollars, And Do You Feel Lucky, Punk?? ← Happy St. Patrick’s Day! Sure’n Let’s All Ha’ A Good Cry! I adored Bishop Fulton Sheen, but I didn’t remember any details from his TV show. I do recall reading his book, “Life is Worth Living.” It made a profound impression on me at the time. Ah, Judy– if anyone got the puns, I knew it would be you!! Nice to meet another Bishop Sheen fan. I knew he’d be obscure for a lot of readers, but I was also sure he’d be of historical interest. Hard to believe there was a time in this country when a Catholic bishop was a top-rated TV star. A lot of non-Catholics watched his program, too. Perhaps I should have remarked on the “JMJ” which Bishop Sheen always wrote at the top of his chalkboard. It stands for “Jesus, Mary, and Joseph,” the Holy Family, and its use is a long-standing convention in Catholic school classrooms. And I included “God Love You!” because that’s what Sheen would always say to close his program. Nope, I didn’t get them all, but I recognized the Green Day one the most. Wooohooo!! This is so cool! It’s a cavalcade of caricatures!!!!!! They’re wonderful!!!! I love the layers of details, how you make the celebrities’ lives dance around them in FUNNY tidbits. I saw Bishop Sheen only a few times, wasn’t aware of his Eraser Angel. What you drew is adorable!!! Your B.B.King is CLASSIC!!!! Love that! And Jennifer Aniston looks more like Jennifer Anniston than Jennifer Aniston does, which is my personal definition of “caricature.” WOW!!!! They’re all so great, Mark. Special, in that extra-special way reserved for people who draw brilliantly. Thank you, my dear Robin, for all your kind words. 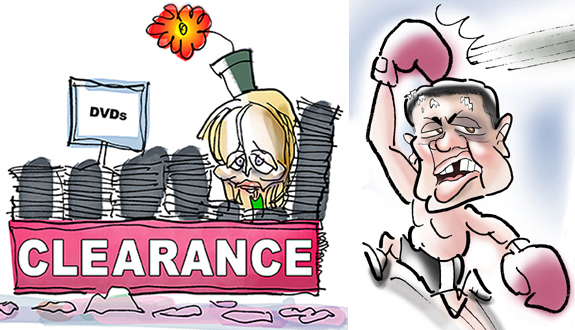 I love “cavalcade of caricatures”– it’s my new mantra. Cavalcade is one of those great words that you just don’t hear enough– thank you for giving it an airing!! It’s funny: the best caricatures do indeed “look more like the person than themselves.” I could never explain that in a million years, but I know exactly what you mean, so that was high praise indeed. Please! Never worry about replying “late” to me. I just replied to a comment someone left me 3 years ago on RB. Appalling. LOL! Calvacade! I’ve loved the sound of that word ever since I first heard it. Someday when you’re world famous, your exhibits will be known as Cavalcades Of Color!! Ah, the Einstein one – that’s great. Dark matter and the mysteries of the musical universe come to mind. Quite awesome imagination Mark. Liked the way it was stylized too. And yes, I do get nervous when I hear about quizzes and tests. No matter what context, right! Aniston was my favorite. I like her, and her hair. Maybe it’s because we share a birthday. Off-topic Have you thought of doing caricactures of professions trying to bust their own steretypes…? Do you mean drawings that push professional stereotypes to an extreme? Like doctors with hammers and saws, and lawyers stealing money out of ambulances?? It’s a funny idea, but I think Mad Magazine has probably plumbed that kind of material pretty thoroughly– at least in most of the issues I’ve read! Loved these. I got far more than I expected. Loved the Einstein/The Who one the best. Yes, I saw the spider and know the song.My favorite is between that one and BB King. Welcome, and thanks again for your kind comment! You have blown my mind Mr. Armstrong! In the annals of one-word comments, you have just scored a major bull’s-eye, and I’m ordering your solid gold trophy today! !